Endoscopic resection of gastrointestinal stromal tumor (GIST) of the esophagogastric junction (EGJ) can be performed by submucosal tunneling and endoscopic resection (STER). However, the maximal reported lesion size is 3.3cm. Enbloc resection is mandatory due to the malignant potential of GIST. 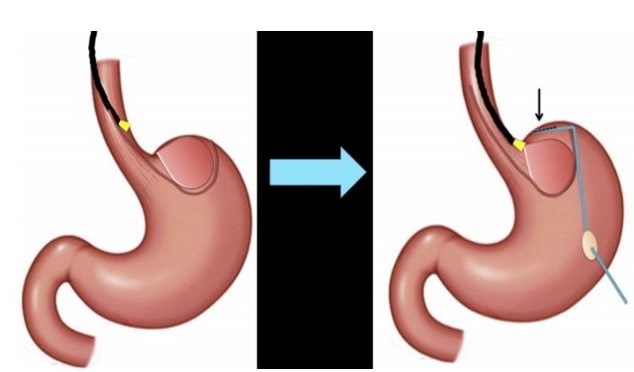 Laparoscopic wedge resection (LWR) at the EGJ is technically challenging with a risk of lumenal narrowing leading to dysphagia and injury of the lower esophageal sphincter. STER of large EGJ lesions can release the tumor from the EGJ and facilitate easy access for transgastric LWR while avoiding risks of LWR techniques. A 74-year-old male with iron deficiency had a 6.6cm GIST at the EGJ extending into the lesser curve. Using a triangle tip knife to create a mucosal incision 5cm proximal to the EGJ and submucosal tunnel to the GIST, STER was performed. The submucosal fibers and underlying muscle fibres were dissected away, leaving the tumor capsule intact. Gastrostomy was formed on the anterior gastric wall laparoscopically. The GIST was free from the EGJ and surgical staples were easily placed at an appropriate angle to prevent narrowing of the EGJ. The GIST was removed through the gastrostomy. Figure 1. Endoscopic submucosal tunnelling releases the large tumor from the cardia and facilitates easy insertion of a laparoscopic stapling device via a gastrostomy on the anterior gastric wall. We demonstrated a combined STER and LWR technique which offered a minimally invasive, safe and effective solution for a patient with a GIST of the EGJ which was too large for enbloc removal via STER alone. However, STER was able to alleviate some of the technical challenges which are associated with surgical (LWR) of the EGJ. Combined endoscopic and surgical techniques can offer our patients solutions which avail the benefits of both techniques. Collaboration and discussion between endoscopists and surgeons is paramount for the success of these procedures.